The most recent car booking in Olomouc has been made on our website 4936 minutes ago. In Olomouc, we offer for rental 4+ car categories from 2+ rental suppliers. 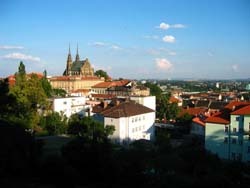 OrangeSmile.com combines car offers from absolutely all rental suppliers located in and around Olomouc. As an aggregating system, in Czechia we are able to provide reduced rental rates that are, in most of the cases, lower than you can get from the suppliers. The search form above allows you to find these offers in Olomouc on any desired period. You can also specify a return location in Czechia different from the pick-up place. The maximum rental period is 30 days. The cars for rent presented in the search results for Olomouc are just example models for each specific offer. Unfortunately, for Czechia we are not able to tell in advance which specific car model will be given at the desk. Rare vehicle types, such as convertibles, sports cars, large off-road vehicles or minivans are available in Czechia mostly at airports. If you are looking for such a car type, please check the airports nearest to Olomouc. We wish the most exciting discoveries while driving around Olomouc! It's great to have fun with the whole family at Avion Shopping Park trading center. It is very large, with dozens of clothing and footwear shops, accessories and original souvenirs stores available to shoppers. There are an excellent bookstore and a grocery supermarket. Interesting entertainment programs are often held there. For recreation, visitors can choose from a wide range of restaurants and cafes. In Brno, lovers of shopping have an opportunity to visit the most interesting flea market Blesitrhy. It runs 10 months a year, except for July and August. This market can be visited only on the second Saturday of the month. Walking along colorful rows, visitors can choose nice home decorations, vintage jewelry and dishes, rare old books and various collectibles. It is worth noting that in this market there is always a choice of souvenirs, so it will be interesting to those who are indifferent to antiquities. The city has many interesting gift and antique shops, one of the most attractive is Antiqkabinet store. The most affluent buyers, as well as budget tourists, will select suitable things and souvenirs. Old artwork, watches and jewelry, antique porcelain utensils, old postcards and miniature souvenirs are always available to customers.